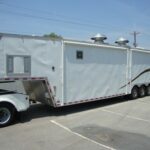 This Mobile Kitchen Trailer 38 Ft is equipped with 80-G water tank, the mobile kitchen trailer also has hot water heaters, hand washing sinks, two three-compartment sinks, 50-G propane tanks and grey water tanks. The entire kitchen is diamond-plated. It features low entrancewith elevation at around 3 feet off the ground. 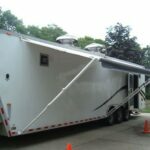 Around 33% more space than other mobile kitchens. 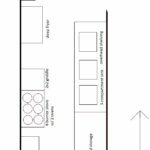 The mobile kitchen trailer comes with burner stove, two ovens and a 2×2 griddle. It laso comes with 35# deep fat fryers and two three-door refrigeration, two-door freezer. The food preparation package also has a convection oven and a stock pot burner. Other Features include a generator. All units are 2007 and newer, means they are in excellent condition. 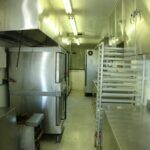 Has a dishwashing system which uses high-pressure commercial cleaning, standard for mobile kitchens these days. It also has Ansel suppression system and the units are cleaned and detailed via high pressure washing system. 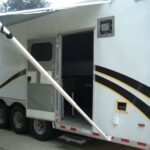 The entire trailer needs to be loaded in a 3500 series or 5500 series truck. A gooseneck 2 5/16th Ball hitch is also needed upon installation. It has an electrical landing gear and weighs 17,600 lbs. The power must be connected directly to a 220 80 A service.